So I'm having trouble figuring out the best way to use the brakes. It seems that when I just pull the rear brake lever it applies pretty much the perfect amount of both brakes. It almost seems like when I pull the front brake lever it doesn't really do a lot. Coming from motorcycle brakes I'm honestly not sure how I should be using the combination. It's not like I'm having any trouble stopping it just seems like I'm just sort of giving a random amount of front and rear lever without much difference in respect to how much I use of either. Can anyone share their experience and let me know how they best make use of the system? I have been riding my Swing since January of 2012 and had to figure out how to use the linked brakes. I generally use the rear lever for most situations. I use the right lever when more braking is deemed necessary. Sometimes I will use the right lever just before coming to a stop just to keep the rotor and pads clean. Linked Brakes-----use right lever, both brakes are applied, rear coming on first.....this makes rear usable in slow speed handling/balancing aide and based on my experience in ice/snow/gravel, used gentle front wheel won't lock and cause dump over. Straight line braking I always apply both levers together....emergency it is habit you have max braking available. ABS, if you have it prevents wheel lock up. As long time rider, I prefer non-linked....because of use of rear alone/me making decisions, rear great balancing aid....I rode over 20 years in Japanese traffic. I have no complaint with SilverWing brakes on my 2013-----pad life appears to be at least 50,000 miles. John I checked to make sure and it's actually the left lever that operates the rear brakes/linked and the right operating only the front. I got right and left mixed up. sorry. Left controls both brakes, rear coming on first. Right is front alone. I use the rear brake to scrub off speed and the front brake to finish thing up. Hope that makes sense. I tend to use the left lever for most normal braking/stopping. If I need to brake a bit harder e.g. when there is a road junction at the bottom of a hill, in 'frisky' traffic or in an emergency then I use both levers together. If I go into a corner a bit too fast and need to scrub of a bit of speed then I use the left lever gently. For manoeuvring around in car parks or on/off the driveway I just use the left lever. I rarely use the right lever on its own - it's either just the left or both together. The left lever only really applies a small amount of front brake, it only activates one piston out of the three in the front calliper (and the smallest one at that). Ditto what Cookie said for me. Left brake gets the most work, but both of my hands cover both of my brake handles..... out of habit. Just remember what trainers tell boxers, "lead with the left". Use both brakes but lead with the left, or rear. You can use the linked brakes as if they weren't linked since most of the effort goes to the rear and less to the front. It's not like both brakes go on with the same force. The "Ride like a pro" videos by Jerry Palladino will work as well on scooter as on a motorcycle. We don't have a clutch to use as he describes but other than that it's easy to adapt his method for a CVT rig. I can do circles with the handlebars all the way over, also figure eights with the handlebars hard over. 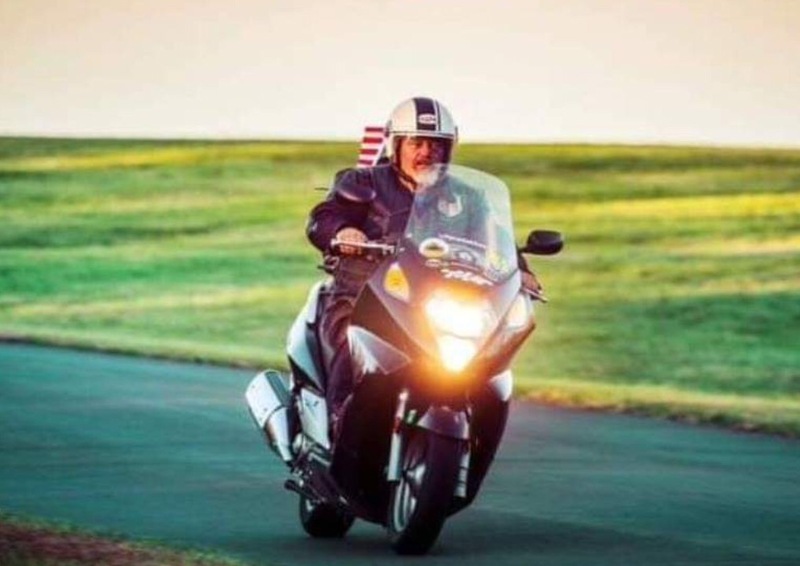 I first learned Jerry's method when I got my first Goldwing. I was pretty intimidated by that big, heavy bike but using his method soon found it easy to make a U turn in a pretty narrow street. With a good bit of practice I was able to do consecutive circles with the handle bars on the GW all the way over in each direction. Works on the Silverwing as well. A few hours of practice is time well spent. Besides it's fun to hone your riding skills. I haven't seen those videos. I'll check em out! I've been on bikes my whole life but I definitely need to spend a few hours in a parking lot of get used to the scooters unique handling. I second the left lever first right later combo as well. I found squeezing right lever only to be abrupt and distracting which can cause more issues down the road (literally) Left lever makes scoot more "planted" during sudden turns and low speeds/parking lot situations. I've been on bikes my whole life but I definitely need to spend a few hours in a parking lot of get used to the scooters unique handling. <<>> the brakes come as a big surprise to most on their first ride including me, my friend said holly c----t this thing REALLY stops. What I notice were the hand brake components were Goldwing, I haven't tried to cross reference the brake pads but it's a thought. Most of the above info is so very good to know. I wish I had the info in this post topic years ago. Left brake first; right brake assists well and is necessary in a stronger, straight line stop. Honda engineers over the years have more experience than all of us put together. There is reason why linked brakes and ABS are superior braking systems. There is a reason why some govt. agencies are requiring ABS on new vehicles. There are good, experienced riders who choose non-ABS brakes, or non-linked brakes. Maybe they are in the one percent of superhero riders who magically control their bikes in EVERY situation, and have never had a spill. That's possible; Tom Brady has a lot of Superbowl rings. But it's kind of like saying, "I choose non-linked car brakes over linked. I can control the car much better that way." Yes, bikes are somewhat different from cars, but in most driving/riding circumstances, the safer option is obvious. If you think you, as an experienced rider, will have complete control in EVERY situation, check out Malcom Gladwell's research regarding the 2009-2011 Toyota recalls. That is an eye-opener! In every one of my accidents, I have tried in vain to find blame on something other than my own fault. In every case, it was "pilot error," even in poor road conditions. Even the accident when the car pulled out in front of me was my error because I assumed that because I had the right-of-way, it wouldn't pull out. My error. Poor road conditions: my error. Braking to slow down in slippery conditions: too much use of front brake: Slam! My error. One of my safe-driving friends one day saw a pretty girl sitting on the porch: Crash! His error. My take on linked brakes on two wheelers---fine safety feature, with ABS maybe almost idiot proof, my case sole minus makes using rear brake alone as balancing aide difficult.....rear heavy/top heavy SilverWing loaded needs some help in slow speed stuff---Honda designed its linked brakes so rear comes on first....but still not enough to please me. My current new bike, Honda CB300F has non-ABS, non-linked brakes. Rear alone in the real slow speed stuff helps old fart balance machine. Now linked or non linked brakes need/should be applied at same time. High speed braking needs practice/reading pavement conditions/feel for traction.....My experience/miles of course tells me ABS is better, but price of $4000 for new bike was the lure to go without it.